Choosing the right handle for your doors may be quite a daunting task for many of us particularly those with little DIY experience. Let's see if we can give you some help to get you started. Step 1) Are they new doors or are you just updating your handles on existing doors? If you have new doors then you can literally choose any handle we have in stock. We also supply our door handles in new door packs to help you select all the hardware needed for your doors. 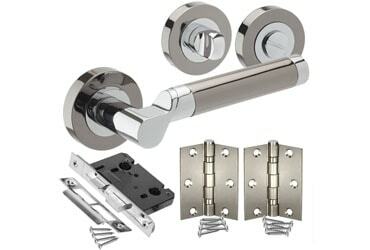 For example a bathroom door pack will include handles, hinges, lock and thumbturn. If you are keeping your old doors then you will have to consider the size of the handle, as in most cases it is best to cover the holes left by the old door handle fixings. We have several designs of door handle on a plate which are very good for this. You may also want to use the existing latch or lock, in which case (provided they are a standard size) all you will need is to select a handle you like and switch them for your old ones. We have many different designs and finishes. If you prefer a traditional look you may prefer our lever handles on a plate. We have some great designs which range from classic to a little more modern. If you have a more modern home then a door handle on rose is probably the best for you. Also a chrome or stainless steel finish will add that extra modern finish to your doors. If you are new to DIY then you may need some help choosing all the right accessories to match your handles. We've made things simple by selling our handles in door packs, new door or bathroom door will suit most people's needs. However if you are still uncertain, then please feel free to contact our knowledgeable staff who will be more than happy to help you with any query.